This soup is really good. It is a great comfort food. I first had this several years ago when a friend from church brought it to me when I was sick. (Thanks Darlene) I have loved it ever since then. 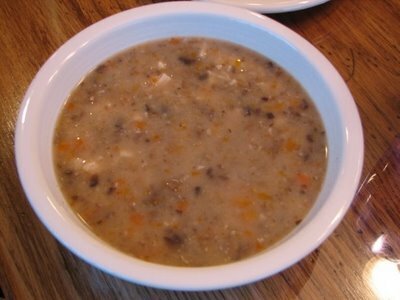 It is a nice hearty fall and winter soup. I like the flavor and texture that wild rice gives this recipe. My husband however, says that he does not like to eat grass, so he does not like wild rice. I can’t convince him that wild rice is not like eating grass. He says he just does not like the texture of it. Even though I like it with wild rice, I usually adjust it so that he will enjoy it. I like to use brown rice or a mix of brown and wild rice. You can also use regular rice but in my opinion brown or wild gives it the best flavor. This recipe is a good way to use up leftover cooked rice. I also think this would be good with leftover turkey. I may try it that way this week. Directions: In a large saucepan, combine the first nine ingredients. Bring to a boil. Reduce heat; cover and simmer for 30 minutes. In a soup kettle or Dutch oven, melt butter. stir in flour until smooth. Gradually whisk in broth mixture. Bring to a boil; cook and stir for 2 minutes or until thickened. Whisk in soup and broth or water. Add rice and chicken; heat through. Yield: 14 servings. Lynn, Just wanted you to know I fixed your 3 Cheese Enchillada’s last Thursday night and had friends over. They were a HUGE success. I just made one change… I have N.M Hatch green chili in my freezer so I peeled and added that. Really yummy!!! Thanks again for this recipe. I liked the soup, but made some modifications as well. I too pretty much hate wild rice, so I cut that down to just under a cup to put it more into the background. I also used fresh chicken broth derived from boiling a chicken carcass from a roasted chicken we got at Costco a few days ago. I strained out the bones, etc. and kept the broth and used it as my base. I also didn’t have any chicken bouillon, so I omitted it (I like to use Better Than Bouillon when I have it on hand). I too did not have celery, so that didn’t get added. I like carrot chunks, so also I chopped them instead of shredding. I also used fresh garlic instead of powder. Oh, one more thing — I added two cans of diced tomatoes and it created a bisque-like flavor that I really like. Thanks for the ideas! Ed in Redmond, WA.